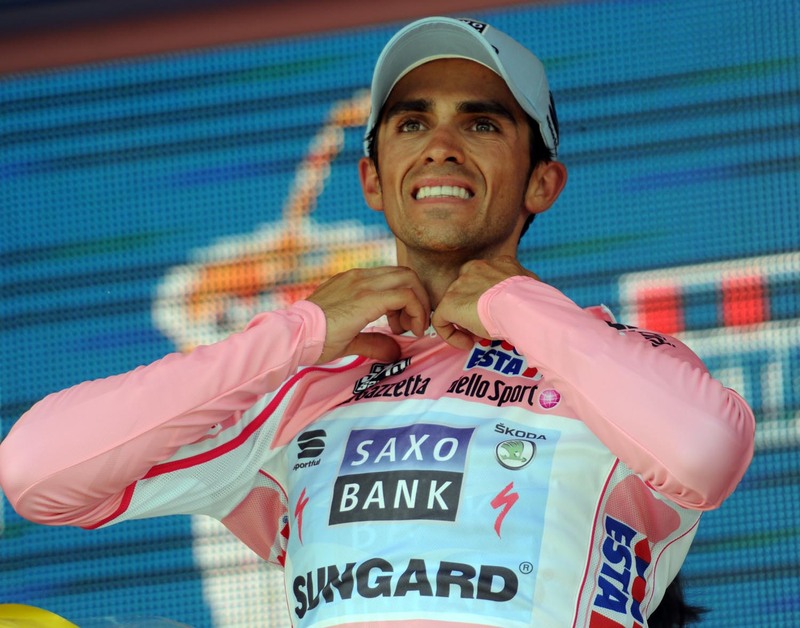 Alberto Contador (Tinkoff-Saxo) rode into Milan in pink on Sunday to claim the Giro d’Italia’s overall victory. The title, he counts as his third despite a doping suspension that saw 2011’s victory stripped. Contador dominated the 2015 Giro from start in Liguria to the finish on three weeks later. He did not give his rivals an inch, striking on Abetone to take pink, reminding everyone who is king on Mortirolo and defending himself despite a small crisis on the Colle delle Finestre yesterday. He also does not want to give away his 2011 title. Due to an anti-doping positive at the 2010 Tour de France, Contador served a suspension and lost several wins including the 2010 Tour and 2011 Giro. Andy Schleck took the title in the former and Michele Scarponi in the latter. On Saturday at the Sestriere ski resort, celebrating his pink jersey ahead of a final flat sprint stage into Milan, he held up three fingers on the podium above cheering fans. “For me, I won that Giro d’Italia, all the people who have watched it on TV, including people who followed me, agree,” Contador explained. The Court of Arbitration for Sport (CAS) said the opposite with its ruling on February 6, 2012. It banned him for 18 months and stripped him of several wins because he had tested positive for Clenbuterol. Though the panel said that Contador’s use was not intentional, it put the responsibility on his shoulders and followed through with an official legal ruling. Contador and some followers see it differently. Regardless, Scarponi’s name is in the Giro’s race book or what locals call the Garibaldi, and the organisers gave him the winner’s spiral trophy at the start of the 2012 Giro in Herning, Denmark. In this Giro and over the years, Contador proved he is a fighter. The rider from Madrid’s outskirts suffered from a brain condition that required doctors to open operate, he dealt with internal team attacks from Lance Armstrong and Johan Bruyneel to win the 2009 Tour de France, and bounced back from his doping ban. Though Contador will tell you it is nine, the Giro d’Italia title today officially makes seven grand tour titles: Giro in 2009 and 2015, Tour in 2007 and 2009, and the Vuelta a España in 2008, 2012 and 2014. Contador will back off and build up again for the Tour de France, starting on July 4 in Utrecht, the Netherlands. He made it his goal over the winter to try to become only the eighth cyclist in history, the first since 1998, to win the Giro/Tour double.